Get Ready For A Cub Scout Safari At Summer Day Camp! 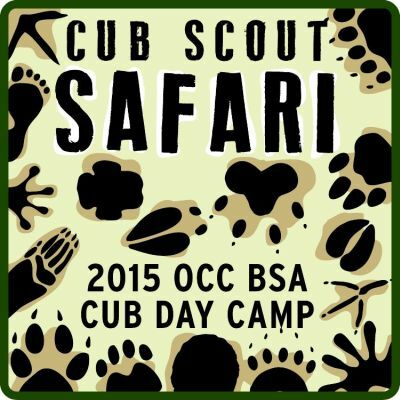 It’s time to register for Cub Scout Day Camp and this year, our Cub Scouts may go on safari! “Cub Scout Safari” Day Camp will be held July 20th through July 24th from 8:30 a.m. to 3:00 p.m. daily at Firestone Scout Reservation right here in Brea! You won’t want your Scout to miss out on five full days of fun adventures and fellowship! In the past few years, most dens have been able to complete between 25% – 45% of their rank advancement within this week. Those scouts who do not attend camp miss out on several key experiences with their den, and often must spend the rest of the year trying to catch up on their requirements for advancement. The camp is run 100% by volunteers. We will need parents to help with the dens and activities at camp. Whether you can volunteer for the entire week, or just for a couple of days, we urge you to sign up to assist this terrific program. In keeping with Scouting guidelines, we need to maintain a ratio of 1 adult per 4 kids every day. Volunteering at Day Camp is a great way for parents to enjoy quality summertime fun with your children! $125 – If registration, medical form, and payment is received before June 15th. $150 – If forms and payment are received after June 15th. Reminder: Scouts who earned a camp credit for last year’s popcorn sales may apply it to the cost of Summer Day Camp (or any other camp this year)! Payment can be turned in at the May 17th Pack Meeting or mailed to Jo Rivera. Siblings are again welcome to attend sibling camp when their parent is at camp for only $5 a day, or $20 for the entire week. All payments can be submitted to Jo Rivera, or paid via our pack store. Registration may be completed via our Pack 811 website. Separate registrations must be submitted for each youth, sibling and adult attending. To register, please click HERE. Completed Medical Forms are required of every individual attendee (camper, volunteer, or sibling) and must be turned in with your payment. Click HERE to complete, print out, and sign this form. Please note the thorough completion of the Medical Form is CRITICAL to Day Camp attendance. This is strictly enforced by the Portola District and Camp Director.